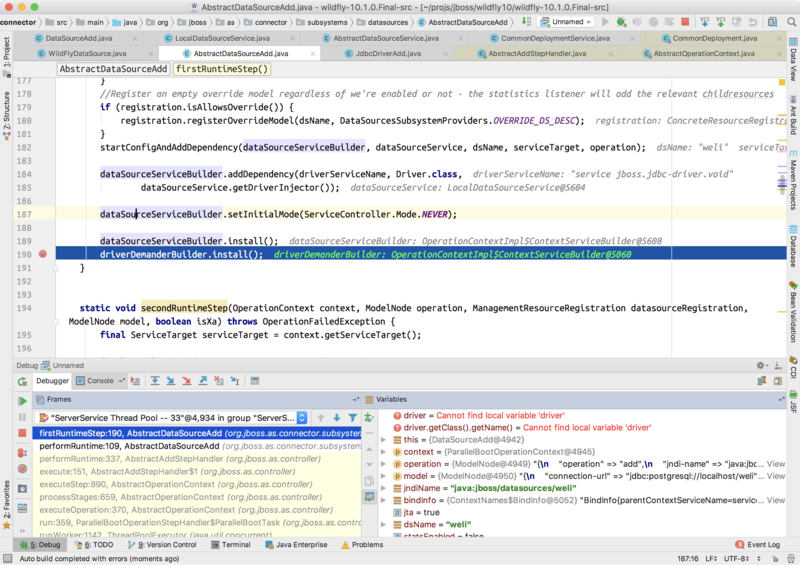 In previous article, I have introduced the JDBC driver loading process in Wildfly. In this article, I’d like to show you the datasource loading process. The above XML data defines our PostgreSQL datasource and the driver. I have removed the sample H2 database configuration to focus on our PostgreSQL topic. 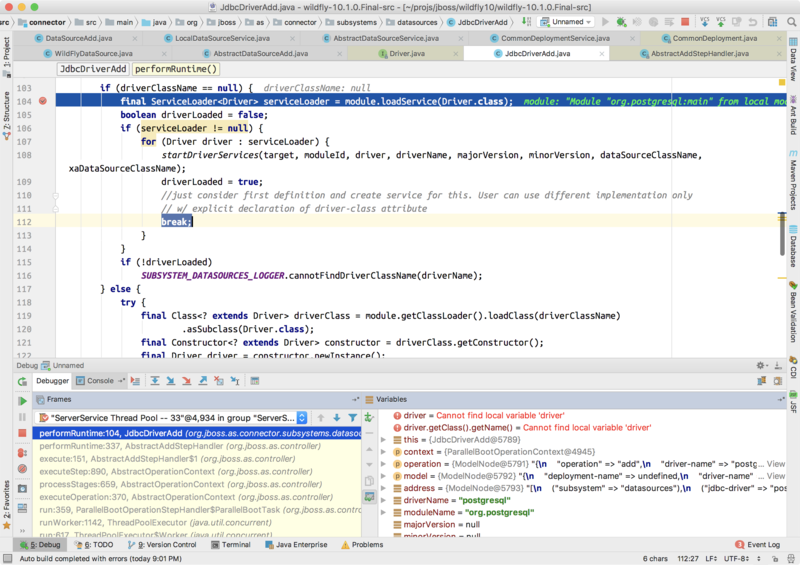 In previous article, we have seen how does the postgresql driver is loaded into Wildfly. The Wildfly server uses JdbcDriverAdd class to do the driver loading work, and it will find the Driver interface implementation for us automatically. The above screenshot shows that the performRuntime(...) method will call the firstRuntimeStep(...) method. From the above screenshot, we can see in firstRuntimeStep(...) method it will create an instance of AbstractDataSourceService class by createDataSourceService(dsName, jndiName) method. This is an abstract method that will be implemented by DataSourceAdd class or the XaDataSourceAdd class. 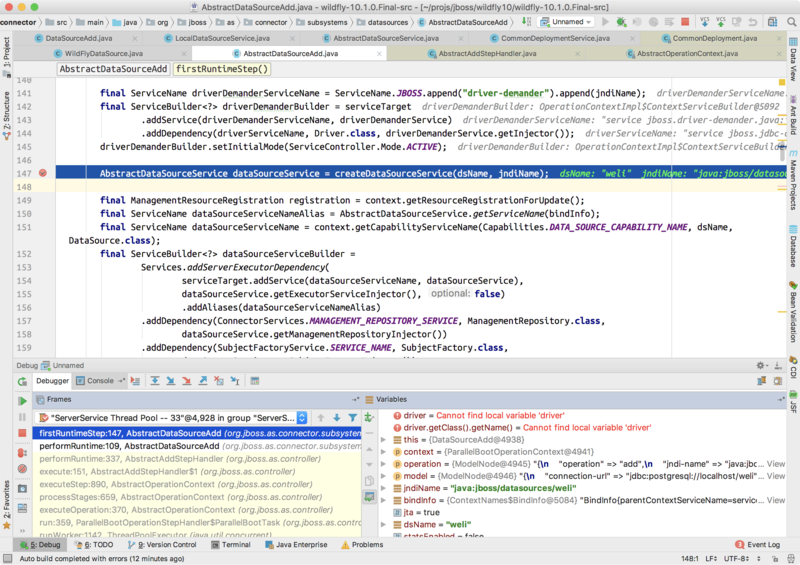 From the above screenshot, we can see an instance of LocalDataSourceService is created. * Local data-source service implementation. From the class definition, we can see the LocalDataSourceService class extends the AbstractDataSourceService class, and the constructor of the LocalDataSourceService class will just call the constructor AbstractDataSourceService class. 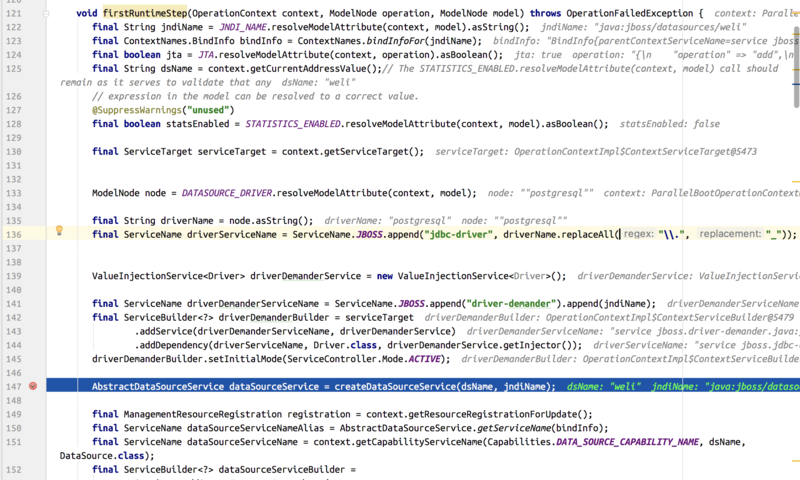 From the above code, we can see the AbstractDataSourceService class will store the name and JNDI name of a datasource. This info is extracted from the configuration file (standalone.xml in standalone mode) set by the users. 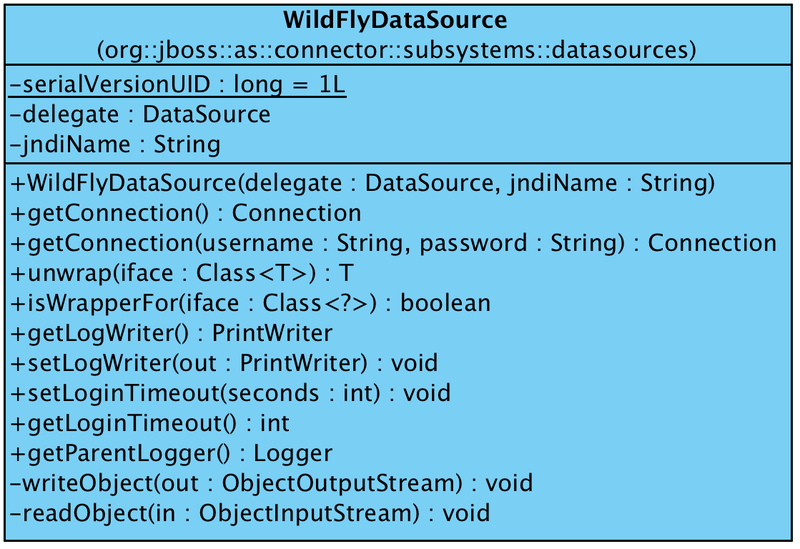 From the above diagram, we can see that the instance of WildFlyDataSource is created in start(...) method. To create the WildFlyDataSource class instance, it uses the AS7DataSourceDeployer to deploy a CommonDeployment (the instance name is deploymentMD) into the Wildfly container. 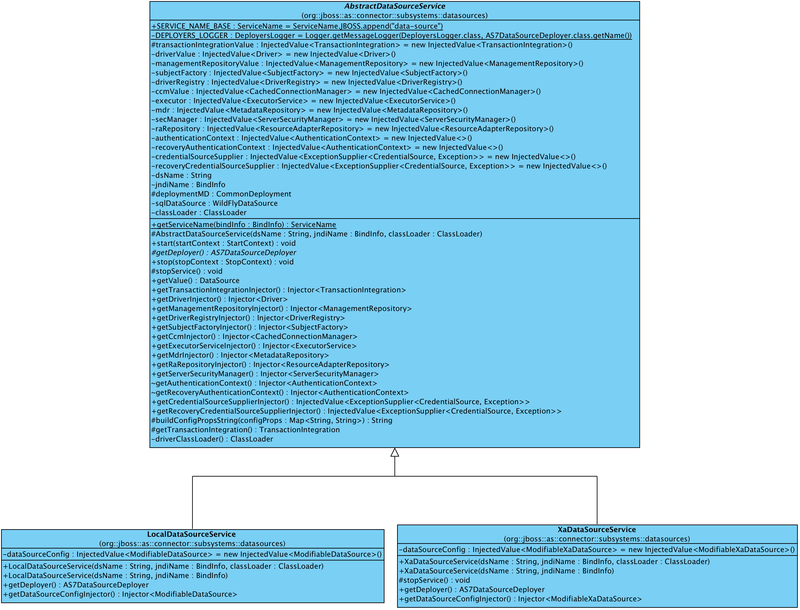 From the above diagram, we can see that the datasource and its referred driver infomation will be wrapped into dataSourceConfig : org.jboss.jca.common.api.metadata.ds.DataSource. 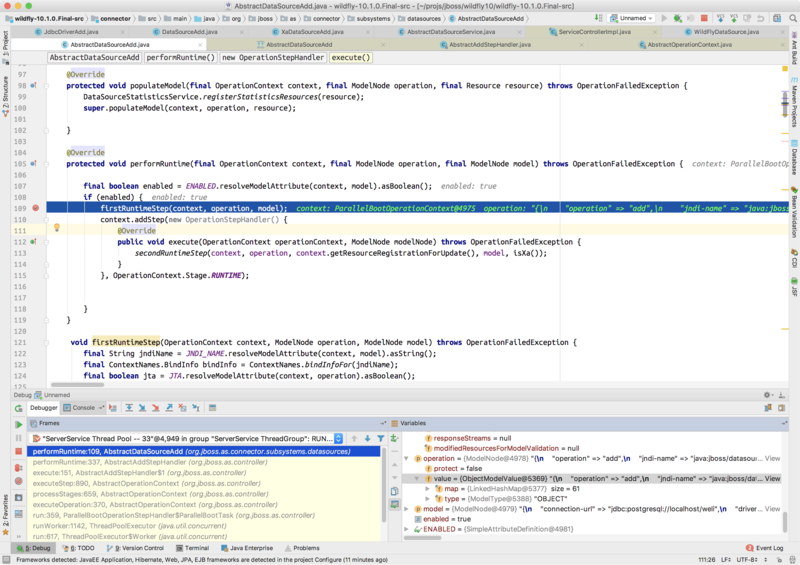 This is the important thing we should know: Wildfly is using the JCA architecture(Java EE Connector Architecture) to wrap the datasource. In Wildfly, the JCA implementation is provided by the IronJacamar project(http://www.ironjacamar.org/). We can’t dive into too many details of this part in this article, and I’ll articles on the topic in future. From the above code, we can see that the WildFlyDataSource is created from the org.jboss.jca.deployers.common.CommonDeployment. In conclusion, our datasource and its relying driver information is registered into the connector system, and the datasource is managed by the connector system. In addition, we can see the driver loading process and the datasource loading process are independent from each other. The driver loading is handled by JdbcDriverAdd as we saw in last chapter, and the datasource loading is handled by DataSourceAdd as we learned in this article. I have extracted the relative log from server output. From the above output, we can see the datasources subsystem is started, and the postgresql driver is installed successfuly. During the datasource loading process, it reports error that it can not find the void driver. This is what we expected. This is reasonable because in standalone.xml we can see the driver setting is in below of the datasource setting. From the above configuration, we can see that the the driver section is belowing the datasource section, but in datasource section it refers to the driver with driver item. By setting the breakpoints in AbstractDataSourceAdd and JdbcDriverAdd, we can also confirm the AbstractDataSourceAdd executed before the JdbcDriverAdd. In conclusion, the Wildfly datasource subsystem will connect the datasource with its driver after loading them independently. Finally I continued the startup process, and the JdbcDriverAdd successfully installed the jdbc driver. At last, the org.jboss.as.controller.management-operation module threw the error as we see in above. We won’t dive into details of the management-operation in this article. In this article, I have introduced the datasource loading process. In next article, I’ll introduce the usage of datasource in Wildfly.